We've built our company around the principles of quality engineering. We are proud to hold those virtues to this day. Our pump repairshop in NY is at your service for any and all repair, maintenance, and service needs. 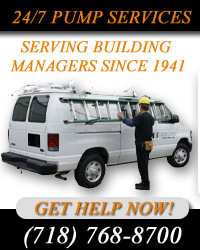 This includes round the clock service, at your door, and when you need it. We know that engineering is all about timing. So our company doesn't hesitate to keep you satisfied with our work. And also, keep your pumps working as they should. Since 1941, NY Pump has brought our expert pump repair to homes and businesses around NYC. We've seen how the industry has changed, the innovation, and the brands to trust. When you call our pump repair shop in NY, you receive prompt, attentive service at prices to fit your budget. Our business has succeeded because of our commitment to your satisfaction, and we ensure that we will complete your pump repair with the same standards and levels of quality we've held on to for over 70 years. Centrifugal pumps are delicate pieces of machinery. There are many small parts, and each requires the other to work properly. Repairs done to these machines require an equally delicate hand. Our attention to detail and constant support help us stand heads and shoulders above the other guys. In our pump repair shop in NY, our team of technicians and experts work for your best interest, and the best interest of the entire pump system. Repair work is usually a last step in the process. The larger work involves regular maintenance, which includes monitoring your pump system for any changes over time. This part of pump service is important, as it can prevent many larger issues from coming up down the road. And when all else fails, we'll repair the pump the moment anything goes awry. And don't wait around, either! This work is time-sensitive, and so is our staff. We'll be at the site in no time at all, and done before you even knew we were there. Our pump repair shop in NY is on call 24 hours a day, seven days a week, with some of the best engineers under our banner. This gives us the confidence to tell you that our work won't take long. And your pump won't be broken much longer. If your centrifugal pump is giving you any aches or pains, let us remove your worry and concern. For more information about our pump repair shop in NY, call NY Pump at (718) 768-8700.